LEBANON, TN – The Executive Office of Sigma Pi Fraternity is proud to announce that Lanse Macke (Oregon State ’15) has been hired as the Director of Strategic Growth within the realigned Undergraduate Member Services department. Macke has served in various roles on staff since April 2015. He will officially begin serving in the new position on April 21, 2018. In the role of Director of Strategic Growth, Macke will work with the new Strategic Growth team to meet universities and create a pipeline for further market penetration, while also having a small portfolio of current chapters who need growth assistance, as well as manage the process for alumni-funded chapter expansion efforts. During his time as a Senior Growth Specialist and previously as an Expansion Consultant, Macke oversaw the growth operations and expansion projects. Through his work directly with chapters and colonies, he focused on many areas including expansion projects, recruitment training, leadership development, performance coaching, and chapter programming. While on staff, he led eight successful expansion efforts across the country. Before joining the Executive Office, Macke attended Oregon State University and graduated with a bachelors of arts in New Media Communications & Music. At Oregon State, Macke held many positions for Omega Chapter, including three consecutive years on the Executive Council, the last two of those being Chapter Sage. He also was tasked with the development a new philanthropy event for his Chapter; “Pi for Life” which benefits the Amazing Day Foundation and mental health awareness. This event continues to be successful year after year. 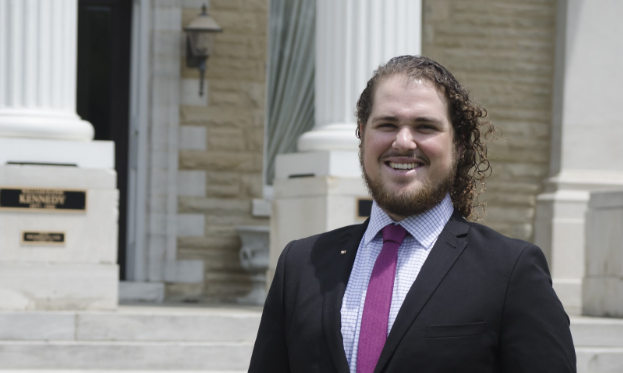 Macke will continue to utilize his personal, social, and interpersonal skills, along with innovative leadership tactics, to strategically grow Sigma Pi across North America. His vision and passion for the Fraternity will continue to shine through his work and attitude. Sigma Pi Fraternity was founded in 1897 at Vincennes University, in Vincennes, Indiana. Our Executive Office is located in Lebanon, Tennessee. The Fraternity is one of the top men’s collegiate organizations in North America, with more than 120 active chapters and colonies in the United States and Canada. With over 100,000 alumni and 5,000 undergraduates; our men strive for excellence by living our core values to promote fellowship, develop character and leadership, advance heightened moral awareness, enable academic achievement, and inspire service. Sigma Pi is the only Greek-letter organization with an international service program, The ACE Project, specifically designed to give back to our host institutions.